This year’s Country Music Association Awards was undoubtedly one of its most political as natural disasters, gun violence and politics dominate current affairs. “This has been a year marked my tragedy … Tonight we’re going to do what families do, come together, pray together, cry together and sing together, too,” said Underwood, who co-hosted the show. “This show is dedicated to all those we lost,” fellow host Brad Paisley said. 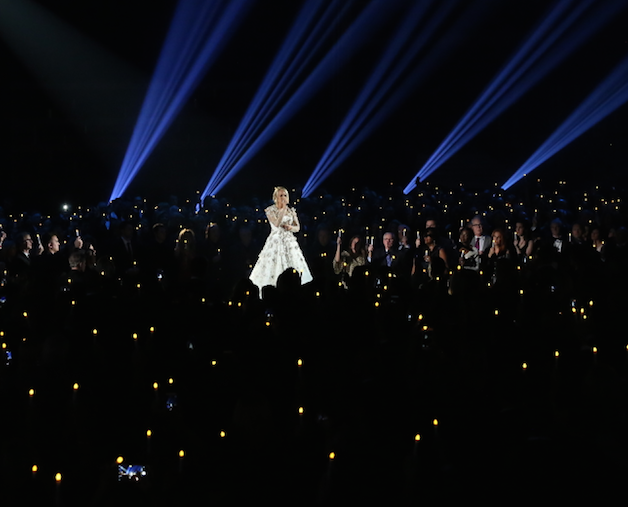 The touching tribute given by Carrie Underwood in the form of “In Memoriam” resulted in the country star spilling over with emotion, crying as the photographs of the 58 people who died at the Route 91 Harvest music festival in Vegas were shown. “Tonight should be about harmony, about what we can do together to change things,” Fairchild added. The show opened with a performance by Keith Urban, Eric Church, Darius Rucker and Lady Antebellum honouring the victims of the recent mass shootings, as well as the tens of thousands of people affected by hurricanes. Urban took the moment to debute a song called “Female”, which he claimed was inspired by the dozens of allegations of sexual assault and harassment against Harvey Weinstein. He earned a rousing applause after the performance, as masses of people took to Twitter to praise him for the performance. Despite missing the event, Taylor Swift won Song of the Year — awarded to songwriters — for penning Little Big Town’s notable hit “Better Man”. Pink sang “Barbie,” backed by several musicians and singers, while One Direction’s Niall Horan performed Maren Morris. Garth Brooks, who lip synced during his performance (because he said he didn’t want to lose his voice), won Entertainer of the Year for a sixth time, beating Luke Bryan, Chris Stapleton, Church and Urban. Stapleton won Male Vocalist of the Year and Album of the Year for “From a Room: Volume 1,” reponding with, “I’m always humbled by getting these things”. Other winners at the show included Miranda Lambert (Female Vocalist of the Year), Brothers Osborne (Vocal Duo of the Year) and Jon Pardi (New Artist of the Year). The Awards also paid tribute to some of country’s brightest stars, including Glen Campbell, who died in August, who was honored during a touching performance of “Wichita Lineman” by Little Big Town and Jimmy Webb, who wrote the song. Rascal Flatts and Dierks Bentley paid homage to Troy Gentry, one-half of the popular country duo Montgomery Gentry, who died in a helicopter crash this September. Eddie Montgomery later joined in for “My Town”, as some audience members sang along, filled with emotion. Paisley and Underwood celebrated their 10-year anniversary — as hosts of the CMAs. They joked about CMA sending restrictions to press, barring them from asking singers on the red carpet about politics or guns. The restriction was rescinded following backlash. They also made reference to politics, taking shots at both President Donald Trump and Hillary Clinton.